Who doesn't love Judy Garland? Star of such movie classics as The Wizard of Oz and Easter Parade, and possessing one of the greatest voices to ever grace this planet. She was a great example of the American Dream, born a child of vaudeville in Grand Rapids, MN (check out the Judy Garland Museum if you're ever in the area) and becoming one of the biggest stars of her day. But her life was also an American Tragedy, used by the Hollywood studio system from a young age, struggling with drug addiction, and dead before the age of 50. 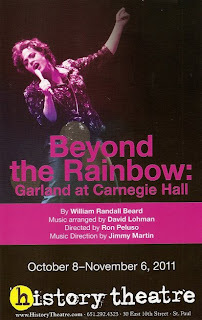 Beyond the Rainbow: Garland at Carnegie Hall does a wonderful job of presenting the highs and lows of her life. The show begins at the beginning of Judy's biggest and most famous concert, Carnegie Hall in 1961, and as Judy moves through the songs she remembers her life story. Actors come on stage to play out the events of her life, as she watches, reacts, and interacts with them. Jody Briskey channels a 39-year-old Judy, and Norah Long portrays a young Judy from the age of 4 through her early 30s. Both women have amazing voices that they've morphed into Judy's, as well as capturing her physical characteristics. Norah looks like she just stepped out of Oz, and Jody's body can barely contain the music as Judy hits her heights. The two Judys converse in an attempt to make sense of her life and come to peace with it, like an onstage musical therapy session. We see Judy's relationship with her vaudevillian parents (played by Peter Moore and Cathleen Fuller), as well as two of her five husbands, Vincente Minnelli (Peter Moore again) and Sid Luft (Clark A. Cruikshank). All of these relationships were troubled; her parents and her husbands were very involved in her career, which led to confusion in her personal life. Through all of her tragedies Judy keeps singing, and the music pulls her through. Beyond the Rainbow was written by William Randall Beard and first produced at the History Theatre in St. Paul in 2005, and has since toured around the country, all the while with Jody as Judy. Her ease in Judy's skin after all those years is evident. The fabulous four-piece band (directed by Jimmy Martin) is just visible on the side of the stage, which is mostly bare except for a stool and a mic for Judy. The supporting actors portray several different characters each, transforming with just a minimal costume change. When not onstage they sit in the shadows, always present like a memory. Cathleen Fuller's Hollywood gossip columnist is the most fun character, at one point cackling like the Wicked Witch of the West. If you love Judy Garland (and as I said, who doesn't? ), check out this play to find out a little bit more about the woman behind the legend and immerse yourself in her wonderful music. In an interesting coincidence, the Guthrie is also presenting a Judy Garland story this season: End of the Rainbow. This show features another concert even later in Judy's life, and will stop in Minneapolis on its way from London to Broadway. I'll be interested to compare the two. I can't imagine anyone capturing Judy better than Jody Briskey and Norah Long.